A NetFlix Original series about a mysterious girl who arrives in the lives of some small town kids, seemingly in possession of strange powers and on the run from a mad scientist? Did Stranger Things prove so popular that NetFlix is now churning out identical shows in the hope that nobody will notice? The OA, which sidled onto the on-demand service’s December schedule with almost no preceding hype, may be superficially similar to Stranger Thing’s sci-fi horror but the new show is concerned more with mystery and faith than B-movie chills. Written and directed by Brit Marling and Zal Batmanglij, who previously collaborated on Sound of My Voice (2011) and The East (2013), The OA opens with mobile phone footage of a woman (Marling) running through traffic to jump from a bridge. This is Prairie Johnson, a blind woman who went missing seven years previously and who reappears with a back covered in intricate scars and a desire to be known only as ‘The OA’. To compound the mystery, she is no longer blind. 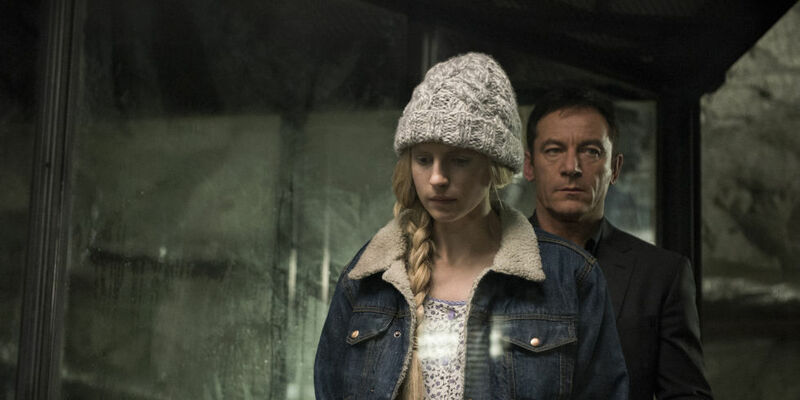 Prairie/The OA quickly draws in a handful of misfits from the local high school, including school bully Patrick Gibson (The Tudors) and teacher Phyllis Smith (The Office, Inside Out) and spins them a tale of kidnap and imprisonment by actual Mad Scientist Jason Isaacs, who keeps a basement full of reluctant subjects to use in his investigations into near death experiences. Prairie and her fellow captives come to believe that when they ‘die’ in Isaac’s experiments they briefly enter a sort of afterlife and learn ‘Movements’, ritualistic gestures which allow them to heal any injury and – they hope – open up a portal so that they may escape their dungeon. They are, she announces, all angels. On the face of it, The OA is quite a silly show. The ‘Movements’ are the kind of interpretive dance you might expect to find gracing the stage at Sadlers Wells and the dialogue veers between naturalistic to cod-spiritual but the performances are all good and Marling & Batmanglij’s script leaves open the possibility that Prairie is an unreliable narrator, adding aspects to her story that she couldn’t have witnessed and embellishing it with characters from books. The special effects are minimal and unshowy, further blurring the line between reality and fiction. Even the Movements have a strange verisimilitude to them, like they belong in an obscure ecstatic religion or a strange twist on yoga but remaining just odd enough that you could believe a crazy woman invented them while trapped alone in a basement. Part of the problem some viewers have had with the show might be rooted in the nature of its form of fantasy. There is nothing intrinsically more believable about the psychic powers and monsters of Stranger Things but the hazy, new-agey form of fantasy behind The OA might seem sillier because of its similarity to real ‘spiritual’ beliefs. Look past this and there is much to recommend in The OA. The show ultimately turns out to be about faith – both in other realms and in the power of human contact and love – and while the finale is abrupt and maddeningly inconclusive it offers plenty of space for interpretation.